Craft allows you to set up two-way synchronization with Pivotal Tracker. This will allow your development team to keep using Pivotal Tracker for Sprint execution while using Craft for Ideation, Definition, Prioritization, Planning and Workflow management. Craft will then be used by you to manage your none-dev resources such as UX, Content, Research and other teams. There are two steps required to integrate between Craft and Pivotal Tracker. Follow them carefully so that the integration succeeds. Important - In order to connect to Pivotal Tracker, you are required to have the login credentials to Pivotal Tracker, and your product in Craft must have at least one Epic and one User Story. 1. Press the Tools tab, located on the Craft toolbar, and select Sync. 2. Press Connect on the Pivotal Tracker tab. 3. Open your Profile Page on Pivotal Tracker. 4. Scroll to the bottom of the page and copy the Token. 5. In Craft, paste the Token into the text field and click Next. 6. Select a Pivotal Tracker project from the drop-down menu, and click Next. 7. You will receive a message confirming your connection with the Pivotal Tracker project. Copy the URL in the Sync Back to Craft pane. Click Sync Data with Pivotal Tracker. Always override Pivotal Tracker items with Craft items. Always override Craft items with Pivotal Tracker items. Use the latest updated date to determine which item should be updated. 9. 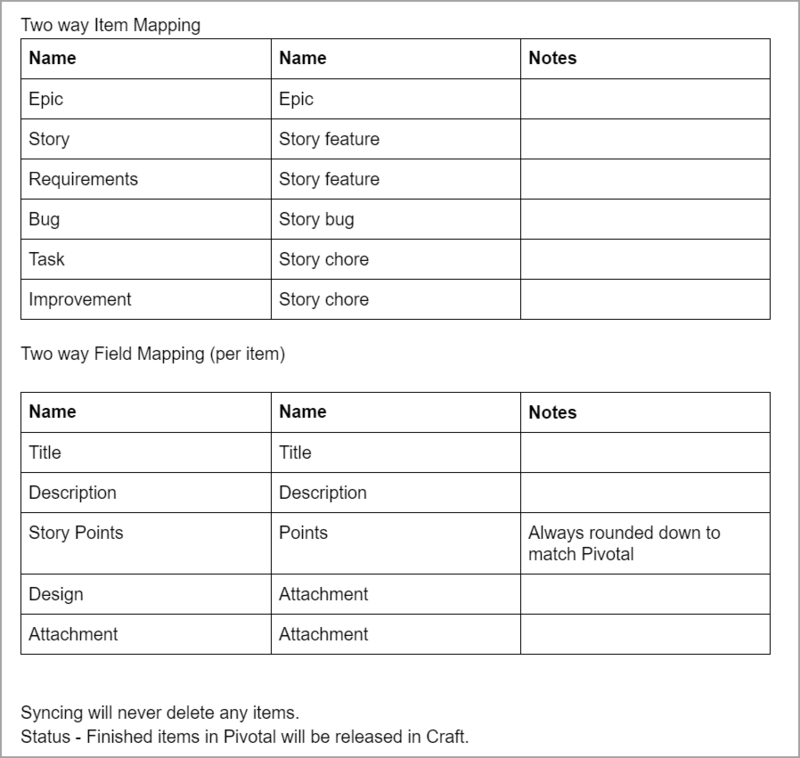 Select whether to push All of the Product, Versions only or Sprint Backlog only, from Pivotal Tracker to Craft, and click Sync (if you select Versions or Sprint, select the required version/sprint from the list). 1. In Pivotal Tracker, open the Settings page of your Project and select Webhooks in the sidebar. 2. Paste the link you copied during the integration between Craft and Pivotal Tracker, select v5 from the drop-down menu. Click Add. 3. In Craft, you will receive a Webhook connection confirmation message. Click Sync to sync items back to Craft. 4. Select the action that Craft will perform when syncing items. 5. Click Sync with Pivotal Tracker.